The market is full of anti-snoring devices, the majority of which offer one specific approach to curb snoring. ZenSleep on the other hand provides a comprehensive system that takes multiple approaches to treating your chronic snoring. Read on for ZenSleep reviews of each of the 5 products in the system, and a complete ZenSleep review that evaluates the whole system. The ZenSleep system is best for snorers who want to explore several different types of anti-snoring devices to find the one — or few — that works best. People snore for different reasons. Sometimes airflow becomes constricted in the nasal passageway. Other times the jaw, tongue, or excessive tissue constrict air in the throat. Snoring is also caused by alcohol use and sleeping position among other factors. The challenge for snorers is to find an anti-snoring device that addresses your specific cause of snoring. If you choose an anti-snoring device designed to alleviate constriction in the nasal passageway, it may not work if your snoring is caused by constriction in the throat. ZenSleep differentiates itself from the competition by offering a comprehensive approach to tackling your snoring. When you invest in the entire package, you receive multiple tools that you can use individually or in tandem as you attempt to stop snoring. You can also purchase each of ZenSleep’s various devices a la carte as you may find greater value in ordering just one product rather than investing in the entire system. This is especially true if you know the specific cause of your snoring and how best to treat it. 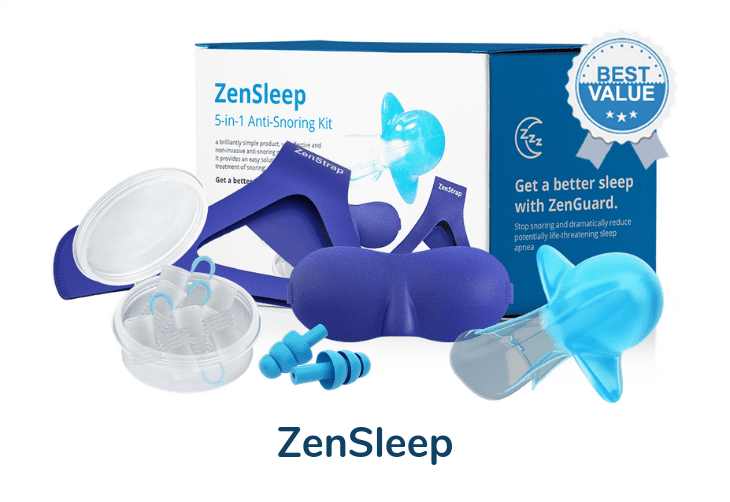 Want a ZenSleep Anti-Snoring Kit? ZenGuard (individually for $299): The ZenGuard is ZenSleep’s most popular device. It is designed to hold your tongue in place so that it can’t fall back toward your throat and constrict airflow. ZenStrap ($79): It’s not always the tongue that falls back to constrict airflow. Sometimes the jaw becomes overly relaxed during sleep and falls back toward the throat. If this is the cause of your snoring, the ZenStrap works to keep the jaw in place to maximize airflow. ZenVents ($49): ZenVents are designed to lift and open nasal passageways to promote better airflow. If constricted air in the nasal passageway is your cause of snoring, ZenVents offer a solution. ZenMask ($39): People sleep best in cool, dark rooms while wearing loose-fitting clothing. The ZenMask blocks out light so that you can enjoy darkness even when the room where you sleep is lighter than you would like. 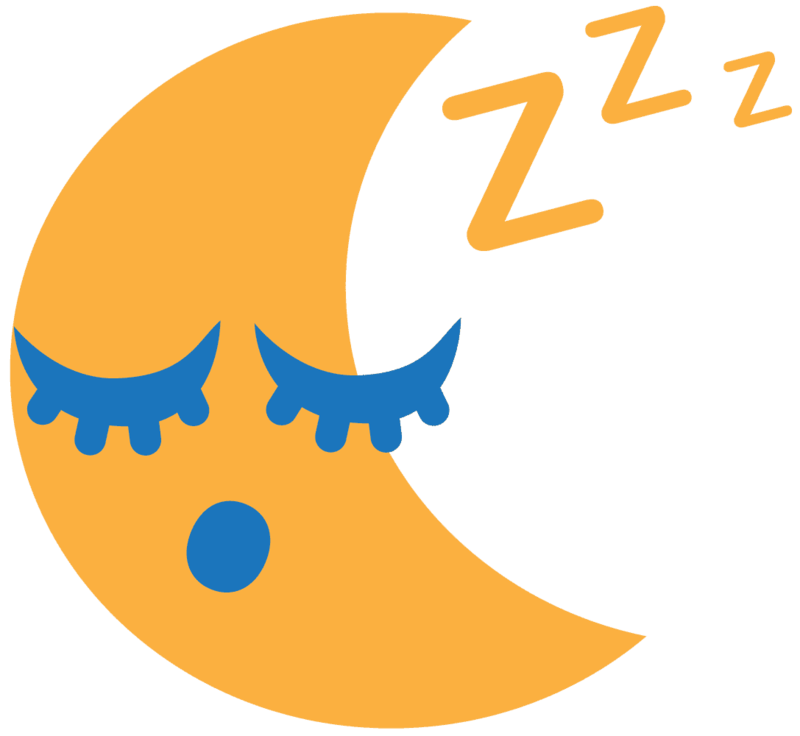 Check the ZenSleep website regularly for deals and discounts. For example, you can often find the ZenGuard on sale for less than $100. Also, ZenSleep regularly runs buy-one-get-one-free deals on its devices. Just be careful on returns – ZenSleep offers a 90-day return window, but charges shipping, handling and disposal fees (since the products can’t be resold). Users can take two different approaches to the ZenSleep system. First, users can try out different devices included in the system, searching for the one that works and eliminates their snoring. Second, users can wear multiple products at once to address various causes of snoring. For example, perhaps your snoring is caused by airflow constriction in both the nasal passageway and the throat. You might find that wearing ZenVents — plus either the ZenGuard or ZenStrap — is your best snoring solution. No matter which anti-snoring device works for you, the ZenMask and ZenPlugs can help create a better environment for getting the high-quality sleep that you need. How Does ZenSleep Stop Snoring? As noted above, each of the products included in the ZenSleep system takes a different approach to eliminating snoring. The ZenGuard keeps the tongue in place so that it can’t fall back and constrict airflow. The ZenStrap does the same thing, but for the jaw — holding it in place so that it can’t overly relax and fall back. 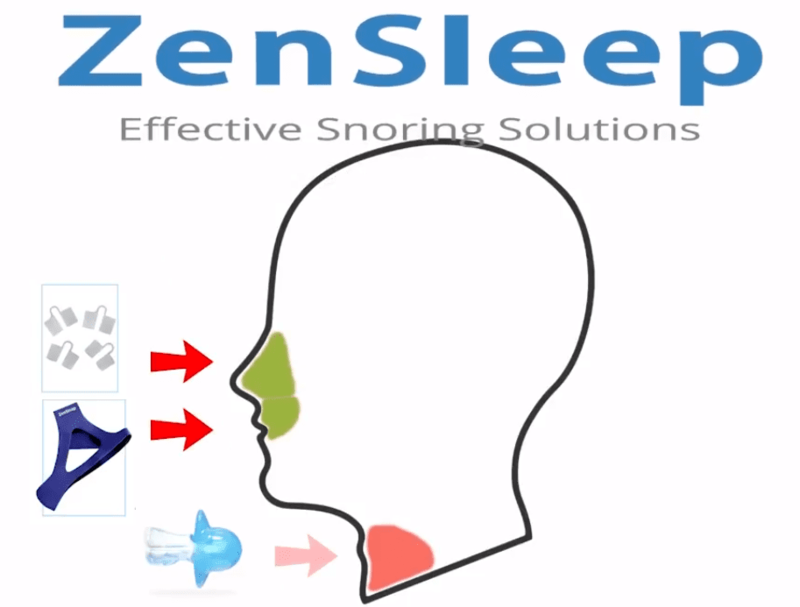 ZenVents is meant to open nasal passageways to eliminate air constriction that causes snoring. The ZenMask and ZenPlugs are ancillary products. They do nothing to specifically combat snoring, but they do promote better quality sleep. The ZenSleep system is a little more complex than other anti-snoring products, simply because it offers several devices in one package. Given the ZenSleep’s complexity, you likely have many questions about the system and its effectiveness, which is why we’ve taken time to answer some of the most frequent questions. Which is Better: the ZenGuard or the Full ZenSleep System? The answer to this question depends on the user. The ZenGuard is highly effective for anyone whose tongue causes snoring. When the tongue falls back toward the throat during sleep, it constricts airflow and causes snoring. If this is your issue, the ZenGuard is your perfect solution. You may be unsure of why you’re snoring though, or you might have multiple causes of snoring. If that’s the case, investing in the entire system is your best bet. You’ll be able to explore various solutions until you find one that works for you — or several that work in tandem. How to Use ZenSleep Products? Each of the ZenSleep products is relatively easy to use. In most cases, you simply put the device on (or into your mouth) and let it go to work. The only product that might take some getting used to is the ZenStrap, but it becomes easier to put on and use after a few tries. Which ZenSleep Product is Right for Me? Again, it’s all about the cause of your snoring. If you’re unsure what causes your snoring, consider talking to a medical professional. If you can pinpoint exactly why you’re snoring in the first place, you can better identify the specific ZenSleep product that’s right for you. The perfect ZenSleep buyer is someone who wants to try multiple anti-snoring devices for the lowest price possible. The market is flooded with different products that promise to eliminate snoring, but the ZenSleep system is unique in that it allows you to test out several different approaches. The ZenGuard is a strong product on its own, though it focuses on tongue retention (rather than jaw support or “mandibular advancement”). 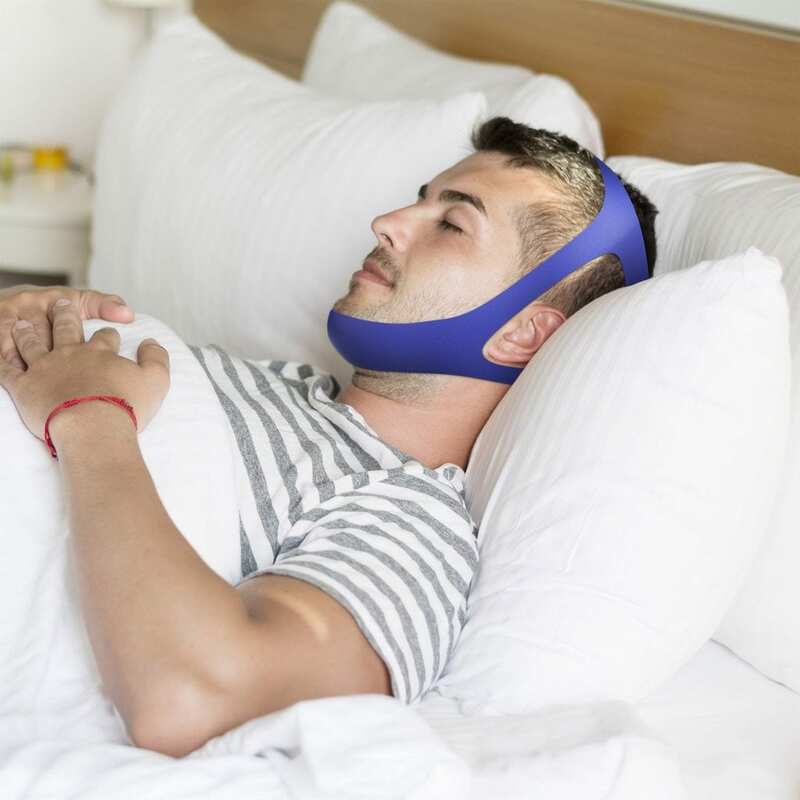 If you’re looking for products that retain the tongue or advance the jaw, do a little more research and compare ZenSleep’s offerings to others. The ZenSleep system is truly unmatched in its comprehensive approach to eliminating snoring. The all-inclusive package is perfect for some users, but not for others. If you’re looking for a system that allows you to test out various products, the ZenSleep deserves your consideration.